Chesapeake Utilities Corporation's Combined Heat And Power (CHP) Plant Named "Best CHP Project Of The Year"
DOVER, Del., Dec. 21, 2016 /PRNewswire/ -- Power Engineering magazine has named the Chesapeake Utilities Corporation (NYSE: CPK) Eight Flags Energy Combined Heat and Power (CHP) Plant "Best CHP Project of the Year." 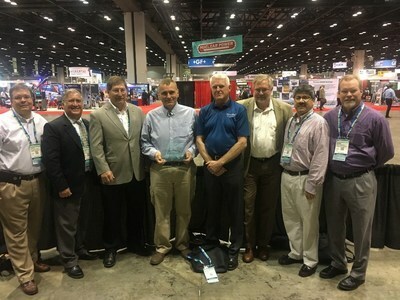 The award was announced during the POWER-GEN International exposition in Orlando, Florida on December 13. "This award is meant to recognize innovative and creative power projects that play a unique role in meeting local and regional demand for power," said Power Engineering Editor-in-Chief Russell Ray. "The Eight Flags Energy CHP Plant goes above and beyond in meeting these standards." "The Eight Flags Energy CHP Plant is a strategic solution designed to meet the needs of our customers and communities while reducing emissions and providing savings," said Michael P. McMasters, President and Chief Executive Officer of Chesapeake Utilities Corporation. "This project, the first-of-its-kind for the Company, is an example of our employees' commitment to developing effective ways to grow while continuing to deliver value to our customers, investors and the communities we serve." The Eight Flags Energy CHP plant is powered by natural gas, highly-regarded as one of the cleanest, safest and most efficient energy options. The plant operates on natural gas provided by Florida Public Utilities Company (FPU) and Peninsula Pipeline Company, two subsidiaries of Chesapeake Utilities Corporation, and produces three energy outputs: electricity, steam and heated water. Rayonier Advanced Materials purchases the steam and heated water for use in its cellulose specialties production facility. FPU purchases the electricity for distribution to its electric retail customers in the area which yields cost-savings and increased reliability. The Eight Flags Energy CHP Plant, located on the Rayonier Advanced Materials plant in Amelia Island, Nassau County, Florida, generates approximately 20 MW of base load power, producing enough electricity to meet 50 percent of the Island's demand. "This plant is one of the most energy-efficient cogeneration power plants in the United States, with a target efficiency of 78 percent," added Jeffry M. Householder, President of Florida Public Utilities Company. "I'm proud of the team of employees and partners who worked diligently to bring this project to fruition. It's a resource that makes a meaningful impact, and I look forward to continuing to find ways to best serve our customers and the community."